Jackson Pollock was one of the most important artists of the post-war era, and indeed of the 20th century. His legacy stems from a number of aspects of his life and work. He remains the archetype of the Abstract Expressionist, with the machismo to boot: he was hard-drinking, hard-playing, one of the centres of gravity of the Cedar Tavern crowd, creating his paintings by flinging paint at the canvas, an ‘Action Painter’ in the extreme. At the same time, that very physical aspect of his process, immortalised in the photographs and films made by Hans Namuth, would come to influence generations of performance artists. But it was arguably his break with the brush, an act that introduced a new relationship to painting itself, that was most influential, a Gordian Knot strategy that would transform the entire landscape of art. What is all the more impressive is the short window within which Pollock made his most influential works: the ‘drip’ really only began in 1947, less than a decade before his tragic, drunken death in a car crash. Pollock grew up in a number of places in the South-West, part of a large family which moved around extensively thanks to the nature of his father’s work as a surveyor. Pollock attended the Manual Arts High School in Los Angeles and then moved to New York, following in the steps one of his older brothers who was also an aspiring artist. Pollock continued his studies in New York, worked on murals, and was enrolled in the Works Progress Administration. His previous interest in Mexican Modernism was concentrated by work with David Alfaro Siqueiros. Meanwhile, his experience with murals would come to give him a new sense of scale that would influence his later masterpieces. During this time, Pollock’s figurative works often featured a powerful sense of swirling dynamism as well as a strong sense of line, both features that would underpin his later ‘drip’ paintings. From the late 1930s, Pollock’s work became freer in its depiction of increasingly internalised subjects. These tended towards the mythic and the psychological, in part prompted by Pollock’s own experiences in undergoing Jungian analysis as a treatment for his alcoholism. The surface of his pictures became increasingly frenetic and textured over the coming years. At the same time, the imagery owed a great deal to the European avant garde as well as his own inner turmoil, showing the influence of both Pablo Picasso and Joan Miró. 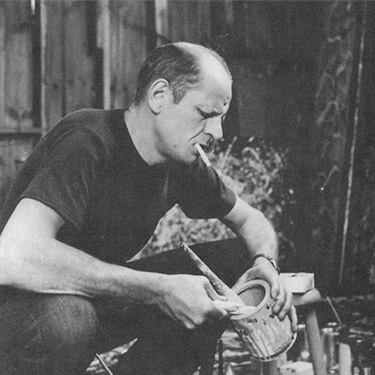 Pollock had become involved with Lee Krasner in 1942 and they married in 1945, moving to The Springs in East Hampton. At a distance from New York, Pollock entered the most creative period of his career, painting works that had an increasingly dense treatment of paint, sometimes obscuring figurative motifs that lay underneath the lattice-like brushwork. In 1947, a new innovation that was to change his work entirely made its apparent debut: the dripping of paint. This began as only one of a number of effects that created the thick mesh of paint upon the surface, for instance in Full Fathom Five of 1947, now in the Museum of Modern Art, New York, in which are encrusted cigarette butts, coins and other objects. Within a short time, Pollock discarded much of the background effect, favouring instead the dripping and flinging of paint, a technique in which he gained increasing rhythmic and compositional versatility. At this point, he began to number his works, for instance in Number 1A of 1948, also in the MoMA. Through his use of deliberately opaque, numerical titles, Pollock was insisting on the pictures being judged and appreciated in their own rights. Pollock’s works were soon recognised as highly important by swathes of the art world, not least his great champion, the critic Clement Greenberg. He was given increasing prominence in exhibitions and was soon garnering a great deal of publicity. While some of this was negative, revealing the resistance to innovation of a large part of the press and public, Pollock’s influence was growing all the time. This reached a new peak in 1950, when Hans Namuth took the famous photographs and made the movies showing Pollock at work, images that would become as iconic as his works themselves. These photographs helped to create a shift in the importance of the creative process in art and in painting at the time, revealing the ‘action’ of the ‘Action Painter’. From 1950 onwards, Pollock continued his work, often reintroducing figurative elements, not least in his calligraphy-like drawings. However, his creativity was derailed by his drinking, which ultimately led to his tragic death at the wheel at the age of only 44, sealing his fate as one of the great, meteoric figures of myth and legend of his time.